If you have a vertical blind on the sliding door in your home, I’ll bet this has happened to you…….. 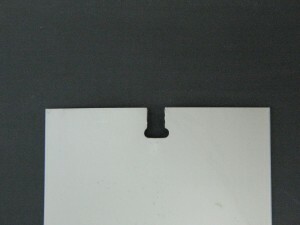 The plastic material of the vertical slat gets old and brittle and eventually breaks just above the hole where it clips on to the track. Replacement vertical blinds vanes are available through Amazon.com or eBay, but the trick is to match the pattern or color of your existing slats. When you can’t match your color or pattern, what can you do? If new blinds aren’t in the budget this year, then you’ll want to watch this video about vane repair with vane savers. These little vertical blind repair clips are inexpensive and will allow you to get some more years of use out of that old vertical blind.